Connect is the term we use to describe ChurchSuite's Sunday service member-facing functionality, The platform is designed to run on a device at your weekend service information and child registration/check-in point. 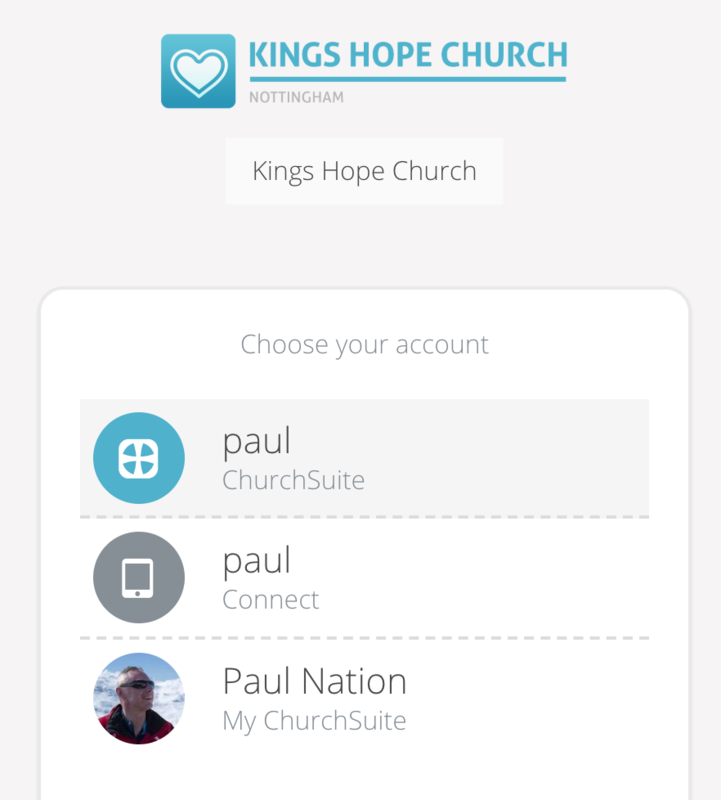 Connect can be accessed by anyone with Connect user permissions through any browser (below) or using the ChurchSuite Connect app available for Android devices. the Child Check-in system - used for checking regular and visiting children in and out of groups at your various gatherings. Event List - browse the list of public/member-facing events from the church Calendar. 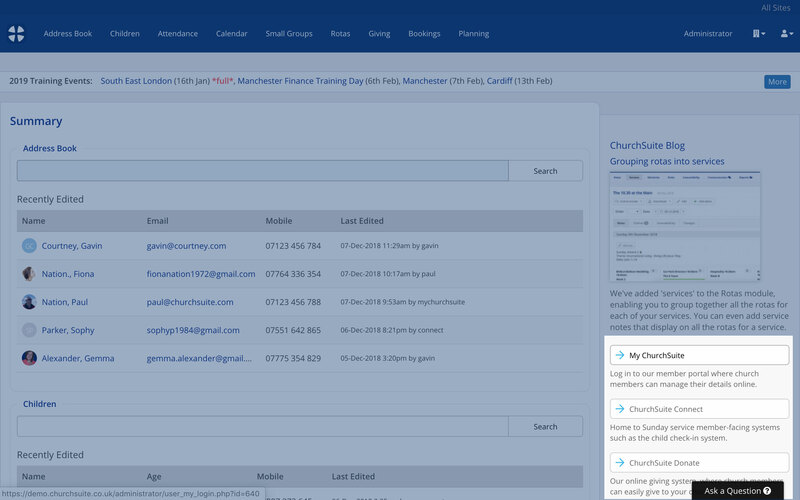 Group List - browse a list or map of your small groups and to sign-up where enabled for the group. My Details - gather contact details and areas of interest for individuals and families. In "Add" this is ideal for use as a newcomer connect form, and in "Edit" mode (optional), existing church members who may not have access to My ChurchSuite can manage their personal information. You can switch applications within Connect using the Select application menu in the bottom left corner of Connect (browser), or using the menu navigation (app). using the login.churchsuite.com login page, entering your username and password and selecting Connect from the login options. 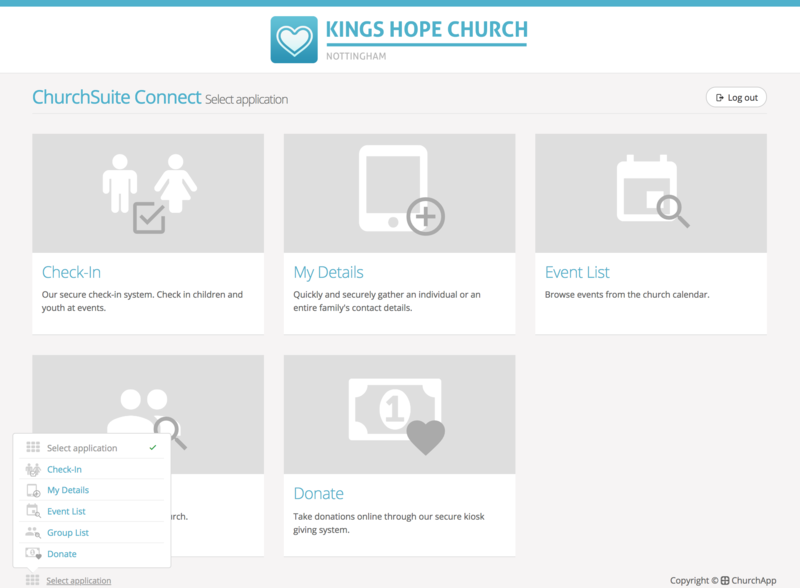 by clicking the Connect quick link on the ChurchSuite Summary page in the admin-facing system (browser only). Further quick links can be found for Child Check-In system in the Children > Attendance section, and for Donate in the Giving > Givers section. using the Android Connect app, available from the Play Store, on a compatible device (the app doesn't include Donate). Ordinarily, access to Connect requires a login with your ChurchSuite username and password if prompted. 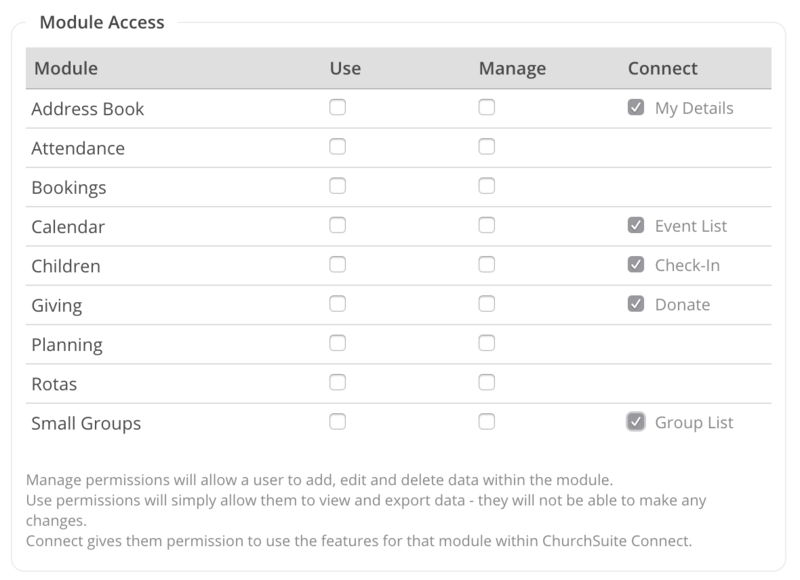 If you're already logged in to ChurchSuite, the Summary page quick links will take you to Connect without requiring further authentication. If you are required to login, ensure that "Connect" is selected. Users will need either Administrator or Connect module access in order to access each respective Connect application. In this way it's entirely possible for users to be created that only have access to Connect, but no wider access to any of your underlying modules of your ChurchSuite admin-facing system - this is ideal for your church welcome desk where team members just need Connect permissions on their device in order to do their role, without giving unnecessary access to the data in the your ChurchSuite modules. We've produced separate support articles for each of the Connect applications - see the related articles below.